Yes folks, you read that right… and no, unfortunately this video is not staged… it is 100% real, and it’s been shocking (and pretty much enraging) people since it appeared online a mear 3 days ago. 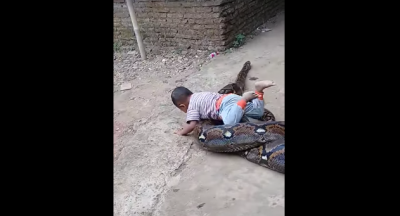 The shocking footage was filmed in the East Java Province in Indonesia and begins with the small child basically lying on top of the curled-up python. 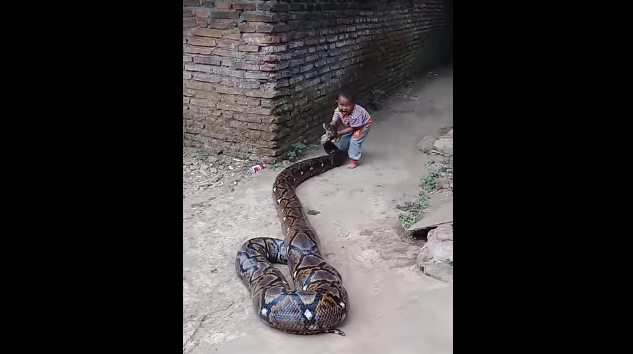 The kid… either not understanding what a python actually is or knows but just doesn’t care (I’m going with the first one here) is having the time of his life messing around with his new found friend. 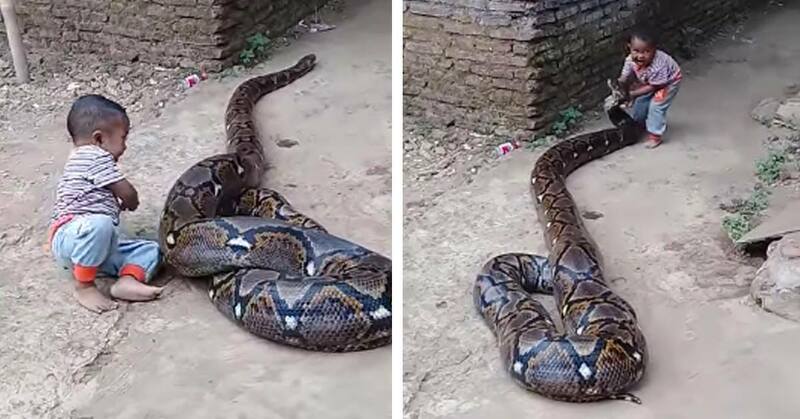 Chances are unless you’ve lived an incredibly sheltered life, you’ll have heard just how horrifically dangerous pythons can be. They’re pretty much known for having enough strength to wrap themselves around a fully grown man and choke him so much his bones become nothing but dust. They are also unable to unhinge their jaw enough for them to be able to swallow an entire baby hippo in one gulp. Yeah… a baby hippo… which is a whole lot bigger than a baby human. And as if the image of a child riding piggyback on top of a python wasn’t harrowing enough, further on in the video the young boy actually physically picks up the snake by the neck, before sticking its face so close to his own that I could almost feel the potential imminent biting on my own face. Luckily for the little boy and his apparently care-free parents, the python didn’t seem to be quite in the killing mood that day. Now, I’m not one to judge… especially since I have no children of my own, who am I to say what’s right or wrong for parents to allow their child to do? 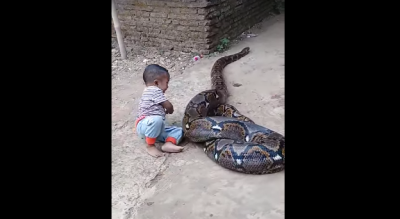 I do, however, have the tiniest bit of common sense, and that tiny bit of common sense is telling me that Kid + Python = Absolute Disaster. …okay well, maybe that one is a little bit of a stretch. All I’m saying is, what it might all come down to is, er, cultural differences. The kid is clothed, looks well fed and pretty darn happy… and after all, aren’t they the 3 most important things to take care of when being a parent? Well, whatever makes you sleep at night I guess.